On June 9, Spectators and tourist alike can expect to be entertained by the fun and exciting demo as Wakeboarders and Wakeskaters will be showcasing their wake board tricks as Pandanon Island in Bohol Philippines will be hosting The Bohol Wake Jam 2012 as presented by The Board Shop a Singapore based one-stop wakeboarding gear company in Southeast Asia. Cebuanos, Boholanos and the rest of the Visayas no longer have to travel to Davao and Luzon to experience wake boarding. The Bohol Wake fest 2012 is a first of its kind month-long wakeboarding event in the country started last May 25 and will culminate on June 25, 2012. The Bohol Wake Jam 2012 is one of the highlights of the month-long Wake Fest where wake boarders and wake skaters from all over Asia and the Philippines will be showing off their skills and wakeboarding techniques. The Board Shop caters to all the wakeboarders’ and wakeskaters’ gear needs. Premium brands like O’Brien and Slingshot Wakeboards, O’Brien and Remote Wakeskates, Ten-80 and Three Apparels are available at The Board Shop. 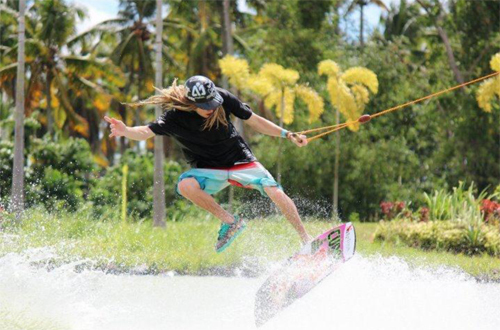 The Board Shop wake boarding gears are also available in Phuket, Indonesia and the Philippines. The Bohol Wake fest is using the Sesitec System 2.0, a straight-line, two-tower cable system that compliments full size cable wake parks for events or as stand-alone rail parks. It is perfect for teaching beginner wake boarders and as well as challenging more advanced riders with the progressive obstacle setups and varied terrain. Sesitec System 2.0 is a German technology. The Bohol Wake Fest is expected to increase interest among local and international extreme sports enthusiasts, boosting the local water sports tourism of Pandanon Island in Bohol and in the Visayas. 0 comments: on "Wake Boarders & Skaters gather for Pandanon Island Bohol Wake Fest 2012"